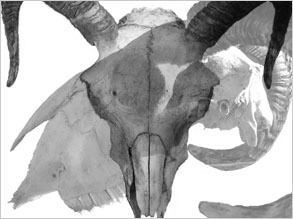 This new set of Photoshop Brushes are created from a Sheep's skull which I found on a recent visit to Scotland. The guy I was climbing the mountain with thought I was mad to pick it up. I have taken several digital pictures of the skull in different positions, If this brush set proves to be popular I will add some more to the Photoshop website. I'm also going to create a new grunge style cracks set using the joins in the skull, should be really good. The new Skull Cracks is done and now online. There are many more Skull Photoshop Brushes available on my site if you like this brush set.